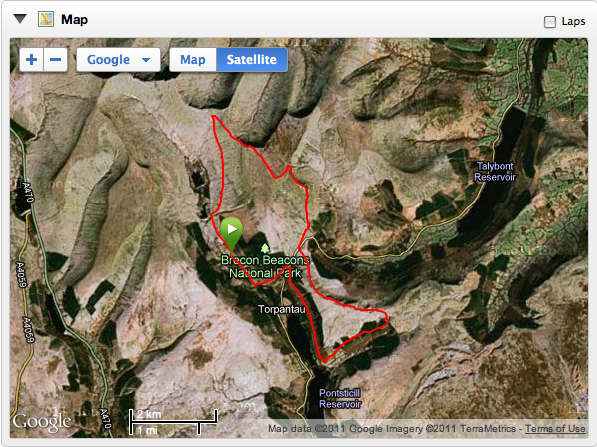 It's been ages since I made time to get up to the Beacons for a Friday run. Marathon training and illness swallowed up November without an opportunity to get out on some real hills, so I was determined to fit in just one trip before Christmas. The weather today started out perfect...crisp, still and sunny. I left Cardiff in the dark so that I had plenty of daylight. I didn't have a very long run planned, but because I've not tested myself on the mountains for a few weeks I wasn't sure what my speed would be like. So I was prepared for it to take ages. I planned a 15 mile route, on a mixture of forest trails and open moorland and I built in a couple of climbs just to test my legs. At mile 10ish, the weather changed instantly and dramatically, as can be the way on the Beacons, and I experienced my first snow fall of the winter. It was absolutely freezing - hat, buff and hood were all required! Given the conditions I decided to take the escape route and headed back to my van for a cuppa and some warm clothes. Pretty pleased with how this went, the 12 miles, 1700 foot ascent took me 2.5 hours, so I'm happy that my fitness on the hills hasn't been completely lost. Photos...the area is beautiful, but just looks lovely when the sun is shining. I'm very lucky to have this on the doorstep.